Please pray for my older brother. He is in the hospital after having a heart attack on Saturday night. I really don't have time to give too many details, but Jim is fairly young (44) and the father of 3 delightful girls. Please pray for a complete recovery and for peace as the family waits for more details. 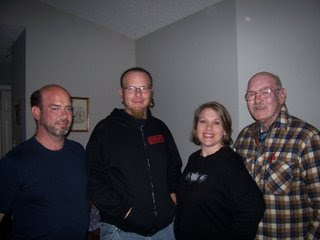 Here is a picture of my older brother (left), my younger brother, myself, and my dad. This was taken last November. Praying now for your brother and your family. I will keep him and your family in my prayers. We're praying sweets. Let me know if you need anything. Love you! My heart just aches for you, your family, and your brother's wife and children. My father passed away from a heart attack when he was only 46. I know those precious children must be hurting so much right now. I was only 18. And yet I can look back now over my life and see the faithfulness of God to me, even though I was not even walking with Him at the time of my father's death. I know I have already commented, but as I read down through your posts, I just wanted to stop and comment once more. Just to let you know from someone who has walked this road, and who is now able to see God's goodness all along the way.